Sorry about the schedule slips lately. Life struck last week and over the weekend, but as for why this particular comic is late, I’ll admit it. Pokemon. I’ve had the chance to battle with a few of you, and it’s been really fun! I won’t be able to play much the rest of the week, but this weekend I’m open for more battling and sending you O-powers. Don’t be afraid to talk, either! I enjoy hearing your voice and you’re probably going to beat me anyway! Me, Rowling, Blank, Palutena, Panda King, Kooper, Snax, Groose, Kremling and anyone else I’ve caught by then look forward to meeting you! Well, I don’t think the inside of that kind of blade is sharp anyway, and Skærva probably knows that from so much fighting Blank. Ooo, Derk looked like he was going to start throwing the power-blasts in panel three. I bet Skærva only agreed because he needed this ship to not have holes in it. How is the Captain even holding the sword like that! The balance is waaaaay over there toward the middle of the blade, unless the gem is some sort of magic-thing. Do magic-things always glow when they are activated? : ? Eyebrowed Skærva in panel four is amazing. I like how Lorelei is still standing in the chair in the last panel. And how her bandana is only visible past the chair when she’s standing. Cyril! Now is the perfect time for a celebratory sea shanty to signify the momentous achievement that is getting Skærva to team up with a pirate captain! Oh, and pirates go “YARRR” all the time. So how long can ghosts possess objects before they get ‘booted out’ or something? Is it just a function of the individual ghost’s patience, or is there actually a force in the world that causes matter and ecto-matter to not want to be in the same place? Would the Admiral be able to stay in that picture for the entire arc, before dramatically emerging at the end to claim the treasure, is what I’m asking. Well, matter and magic (the latter being what a soul is… in essence it’s the strongest “spell” that exists) can inhabit the same place since they exist on different planes. But a spirit was designed to fit and grow perfectly along with a body, and so when a ghost possesses an object it’s not perfect; it sticks out a bit. That’s where the glow comes from. So you can use a spell to get the ghost out, or even just throw some starch on it (the part of it that hits the “excess ghost” will start to congeal and the ghost will get booted out of the object). But I don’t think there’s a time limit. The Admiral isn’t really there He’s at peace, I think. He didn’t do anything wrong. Or… I wonder if he turned pirate himself, or if he left the revenge to his kin and supporters. A story for another time! It very well may be! In our world there aren’t usually giant talking salamander pirates to wield such swords, either! I guess I underestimate how heavy swords would be. I don’t usually handle them; the only swords I really have are a replica of Sting (so it’s a Hobbit sword! Quite small), and the sword which inspired Blank’s, which is… a plastic costume prop Thanks for pointing that out. I don’t imagine they always have to. It’s mainly something I do in the comic so you can tell what’s going on. If the sword here is truly enchanted to be light in the hands (I don’t want to make excuses for my art mistakes, but you can if you want, heh), it would probably be something more like a constant state than that which is temporarily activated, so it wouldn’t necessarily glow. The glow is what’s visible in our plane from a strong interaction on the magical plane. It wouldn’t necessarily appear on more subtle or weak spells, or things that take place internally to an object/person rather than requiring a transfer of energy. I would imagine holding that sword being like holding a stick about the same length. A sword like the one in this strip would likely be around 10 pounds. Good LORD that sword is bent! It hooks nearly 180 degrees, how the hell does Goldgills draw it from a scabbard? Looks like he stuck a handgrip to a guillotine! …which, to be fair, would be a pretty badass thing to do if you can wield it. Which, evidently, he can. Speaking of which, I never understood why people with curved swords hold the sword convexly to people’s throats. I’ve seen it a fair amount in movies, tv, etc., bit isn’t that edge not sharp? I was going to say maybe they just want to be threatening without actually planning to hurt someone at the moment, but… I like what Aslandus said. I always assumed that the inner edge is sharpened so it can act like either a sword or a scythe. Still, I haven’t used a curved sword in my life, so I’m not an expert. HE is priceless. Gonna miss him so much when this arc is over, but I am really looking forward to what’s next. Honestly, sharpening that edge of a sword like that is not a good idea, considering that is the edge facing you the most. I would also think that could mess with the structure of the sword. Also, it takes a lot more force than what you might think to cut a head off, bone doesn’t like getting cut. Do you have any experience with it or something? Fair enough; we can say that Goldie has no desire to purposefully or accidentally slice into sharkboy’s neck at this time. Not in front of the lass, anyway. Not with curved blades, but I have an actual claymore and have had practice with a few others. Come to think of it, I think the sword in the strip would be more like 5lbs. Lord Skarva just can’t bring himself to call it what it is: a Treasure Island. When there’s money in the ground, there’s murder in the air! Murder in the air! Shiver my timbers, shiver my sails, dead men tell no tales! Aaaaaaa everybody’s talking about pokemon but meeeeeee! My last game was Platinum! D,: Ah, well, maybe I’ll get it somewhere during my next school break. …LOVE that shot with the sword. Love the Excited Pirate pose more. Love Derk’s protective rage most of all! It’s not very often we see him in a position to want to protect Skarva, since usually they’re in it together, and now that he IS, he’s not an onlooker or cowering in fear. I wonder if the Captain would survive if any mark was laid upon our dearest Lord Skarva. 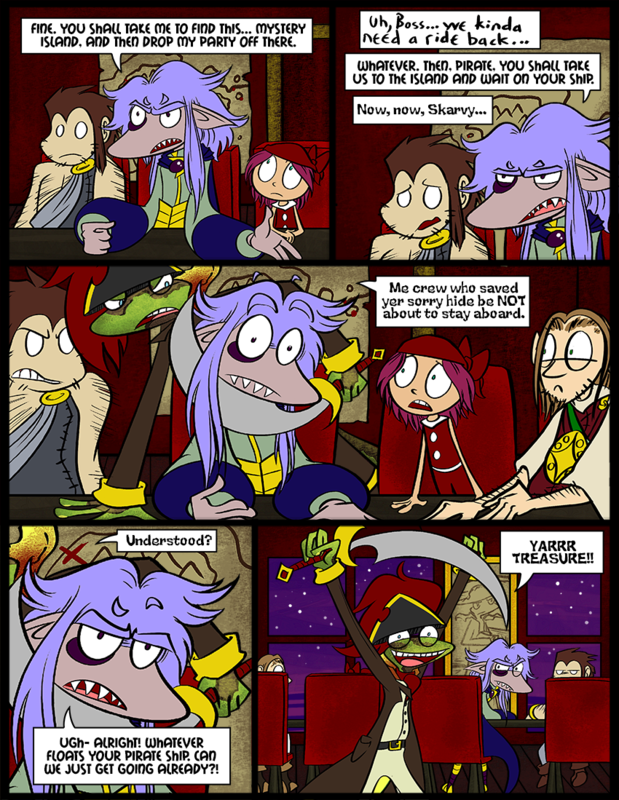 That being said, I hope there’s a point in this comic in which Skarva saves Derk’s life. I start to feel sorry for Derk the Body Guard every now and then. That’s not surprising at all that it still works! My Game Boy Color still works, and my Super Nintendo, and Victor’s NES. Nintendo knows how to make ’em! Compare that to my 360 which red-ringed within a number of months. Granted it was refurbed, but still. Yeah, I still have an old Gameboy in my portable-gaming-device-bag. And two Colors. The only thing I have that didn’t survive is, ironically, my DS (the top screen snapped off partway). Yay! Old gaming consoles/handhelds! I have at least one of every nintendo console/handheld (excluding XL DS, regular 3DS, and a Wii U) and they all work!. Have you seen the 3DS’s screen? It is huge! Speaking of games, I seem to have lost my weekend to Pokemon Y. I actually didn’t think I would enjoy it this much. Hey! I think we battled on, what… monday? You gave me a run for my money! You know, I couldn’t hear you, I’m not even sure I had it on. Do you know where the setting is? If I challenge you to a battle, it should ask if you want to use Game Chat. This captain reeeeally wants treasure, huh? Also, didn’t think that the sword had an edge on the opposite side. Yeah, that’s been the big controversy on this comic. You decide: is it actually sharpened, or is Cap’n just trying to be threatening without a real intent to harm? And yes! We need to battle again Courtney! It was so much fun! I want battle, engage in battle. Battle. Jupiter. My weekend is Sun-Tue so that is the most likely time to catch me on. A happy Goldgills is a cooperative Goldgills, Skaerv. I love how quickly the Captain goes from a cut-throat pirate to a crazy treasure obsessed one. You know, I have always imagined Skärva’s sleeves to be like a plush or something like a pillow. It must be nice having pillow arms. Derk’s not too happy ’bout them threats to Skarva. Also, I didn’t expect you to be a Kid Icarus fan! I think, at least. Since you named a Pokemon Palutena. Yup! Just as of recently. I got my 3DS a couple weeks before Pokemon came out, so I borrowed Uprising from Victor. Great game! Palutena is my Helioptile since her head lights up… goddess of light and all that! My Pit is a Pidgey.